There has been a great deal of research surrounding the Poincare Conjecture since I first wrote this page many years ago. Most recently, Grisha Perelman has announced a proof of it; in fact, he has announced a proof of the far more sweeping Geometrization Conjecture. I hope to clean up these pages one of these days, which, admittedly, never were very well-written; stay tuned for further developments! Topology is the mathematical study of 'shape'. The popular term is 'rubber-sheet geometry'; it is the study of the properties of an object that do not change under continuous deformations (such as stretching and bending (but not tearing)). The most basic problem in topology is to determine when two topological spaces are the same, that is, they can be identified with one another in a continuous way. The Poincare Conjecture is essentially the first conjecture ever made in topology; it asserts that a 3-dimensional manifold is the same as the 3-dimensional sphere precisely when a certain algebraic condition is satisfied. 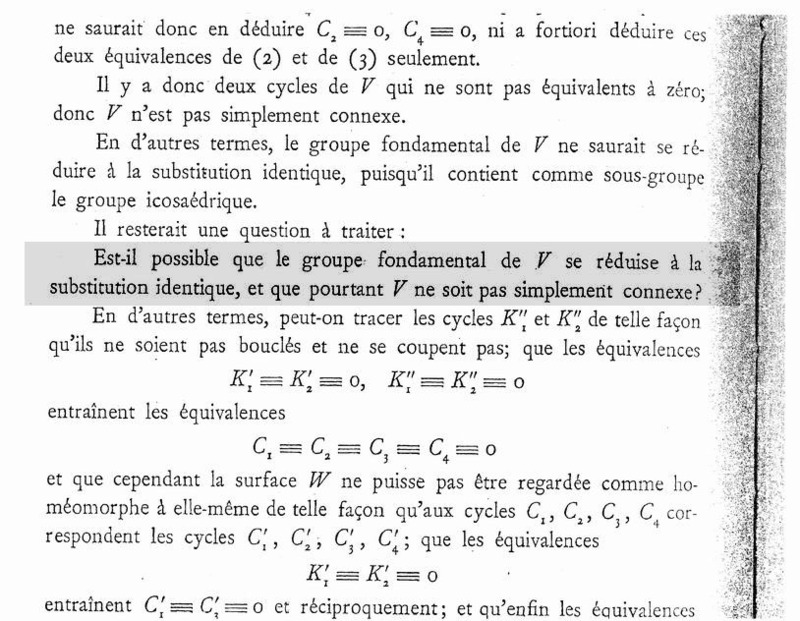 The conjecture was formulated by Poincare around the turn of the 20th century. A solution, positive or negative, is worth US$1,000,000 , since it is one of the Millenium Prize Problems maintained by the Clay Mathematics Institute. The history of topology dates back at least to the middle of the 18th century. One of its first major boosts came at the end of the 19th century, when Poincare was trying to understand the set of solutions to a general algebraic equation f(x,y,z)=0, where x,y,z are complex numbers. To understand the set of solutions, he at first tried an analytic approach, but he ended up adopting the approach of assigning algebraic (= numerical) invariants to (successively more general) geometric objects, as a way of (having forgotten his original motivation!) classifying these geometric objects. This approach can be considered the beginning of what we now call algebraic topology. If M is a 3-manifold ( = a space such that every point has an open neighborhood homeomorphic to 3-dimensional Euclidean space) which has the same homology groups as the 3-sphere S3, then M is homeomorphic to S3. In fact, he went so far as to assert that he had a proof, although the margin was too small to contain it (no, wait, that's a different theorem...). This would have been a really great theorem; unfortunately, it's false. 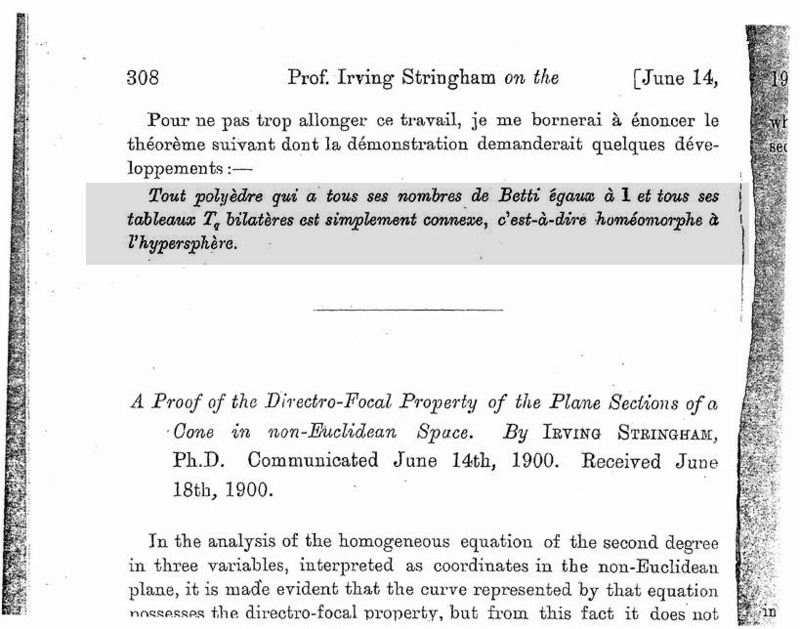 Poincare himself found the first counterexample, a space which is now known as the Poincare homology sphere. In the process he basically invented the fundamental group of a space. Because that's what he had missed; the 3-sphere not only has trivial (first and second) homology groups, but it also has trivial fundamental group. That means that any map of a circle into S3 can be extended to a map of a 2-disk into S3. And you can (with some work) build a 3-manifold with the same homology groups as S^3, but with non-trivial (finite) fundamental group, which Poincare did. It is an amazing little fact, however, that the Poincare homology sphere is the only known such example (and is conjectured to be the only one!). If you are willing to have a manifold with the homology of the 3-sphere but infinite fundamental group, building such a space is fairly straighforward, using Dehn surgery on knots; they're called integer homology 3-spheres. It is one of those not-very-well-known facts that the fundamental group p1(X) used to be denoted by p(X) (before we learned to number them), and was called simply the group of a space. Do you know why we use p to denote it? That's right, it stands for Poincare. PC: If M is a 3-manifold with trivial fundamental group, and H_i(M)=0 for i=1,2 and =Z for i=0,3 (i.e., M has the homology groups of a 3-sphere), then M is homeomorphic to the 3-sphere. In other words, a few basic algebraic invariants can distinguish the 3-sphere from all other 3-manifolds. This has turned out to be a bit harder to do; in fact, we don't (as of this writing, anyway) know how to do it. But that isn't for lack of trying! In fact, an entire AMS subject classification number (57M40) is devoted to papers which attempt to prove or disprove the Poincare Conjecture. Many proofs have made it into the literature, and in more recent years some have made it into the public eye in the form of press releases in the New York Times! The fact that we can't prove the first conjecture ever made in our field is a constant source of amusement/concern/frustration/embarassment (depending on your point of view). (1) Try to prove it. (2) Try to disprove it. (4) Prove that other things that you don't know how to prove imply it. (5) Prove that it implies things you don't really know are true. But to get back to my point, let's look at an example. In the early 1930's, J.H.C. Whitehead published a proof of the Poincare conjecture. His argument went as follows. Take your simply-connected 3-manifold M, and remove a point, to get a non-compact manifold X. now, if you did this to what you think M is, namely the 3-sphere, you would get R^3. In general, about the only thing you can immediately say is that X is contractible; it can be continuously deformed within itself to a point. What Whitehead showed was that every contractible 3-manifold is homeomorphic to R^3. Therefore, starting with M and going to X, you get R^3; putting the point back in amounts to taking the one-point compactification of X (i.e., of R^3), which is the 3-sphere! The only problem is, he was wrong. Luckily he proved himself wrong, and published a counterexample to his above argument about a year later, in the form of an example of a contractible 3-manifold which wasn't homeomorphic to R^3. It is now called the Whitehead manifold. [The following description was lifted from a 1995 email of Greg Kuperberg's.] Briefly, let V be an unknotted solid torus in S^3, let h:V -> V be an embedding of V in V such that h(V) is knotted in V but unknotted in S^3, and let X = intersection of all h^i(V). (You need to know that the meridian of V is null-homotopic in S^3 - h(V), as well.) Then W = S^3 - X is contractible, and moreover W x R is homeomorphic to R^4, but W is not homeomorphic to R^3. So why is this a good thing? Well, contractible open 3-manifolds had never been imagined before, here was this new object to study, and people went out looking for them and found tons of them. McMillan showed that there are, in fact an uncountable number of mutually non-homeomorphic ones. This got the people working on another conjecture, that the only contractible 3-manifold that covers a compact 3-manifold is Euclidean 3-space, really excited, because there are only countably many compact 3-manifolds, so cardinality tells you that the vast majority of these guys aren't covering spaces. But it took another several years before anybody proved that any specific one didn't cover - it turned out to be Whithead's example! There's another great thing that came out of this, but I can't tell you about it right now. Wait a bit (or jump to here). I'm not sure what I can say about this; `everybody' believes it's actually true. I do remember once hearing that R.H. Bing's attitude towards the Poincare conjecture was that he would always spend two weeks trying to prove it, then two weeks trying to build a counterexample, and repeat the process over again. The idea behind finding a counterexeample is easy enough; build a 3-manifold whose fundmental group you can compute is trivial (the homology groups then actually come for free), and then try to show that you were lucky enough to build something that isn't a 3-sphere. This last part was the part that nobody could ever figure out; mostly their time was spent trying to find invariants that had a chance of distinguishing a homotopy 3-sphere (as they are called) from the 3-sphere. There was some hope for awhile that the Casson invariant would do this, but it turned out to be something computable from the fundamental group, if I remember right. There is in fact now an algorithm, due to Hyam Rubinstein, which when given a 3-manifold will decide in finite time whether or not it is the 3-sphere; but I don't know if anybody has tried to start feeding it known lists of homotopy 3-spheres yet. The idea here is that if your're going to be embarassed at not being able to prove a conjecture, you will be less embarassed if you think of yourself as begin unable to prove something *harder* than your conjecture, instaead. After all, it's harder! With the development of algebraic topology, the terminology and techniques were invented to put the Poincare Conjecture in a more general context. A 3-manifold with trivial fundamental group is homotopy equivalent to the 3-sphere (hence the name "homotopy 3-sphere"), and so the Poincare Conjecture can be stated as the assertion that every 3-manifold homotopy equivalent to the 3-sphere is homeomorphic to the 3-sphere. One can generalize the Poincare conjecture by not restricting yourself to 3 dimensions, but instead try to answer the question in all dimensions. The Generalized Poincare Conjecture states that for every n, an n-dimensional manifold homotopy equivalent to the n-sphere is homeomorphic to the n-sphere. A specific instance of this conjecture, e.g., n=5, would be called the n-dimensional Poincare Conjecture. A topological n-manifold homotopy equivalent to an n-sphere is homeomorphic to the n-sphere. A smooth n-manifold homotopy equivalent to an n-sphere is diffeomorphic to the n-sphere. A PL n-manifold homotopy equivalent to an n-sphere is PL-homeomorphic to the n-sphere. For 3-manifolds, these distinctions don't really exist; every 3-manifold has a unique smooth and unique PL structure. (Poincare didn't know this; but everybody in the early days simply assumed that any manifold they worked with was a union of simplices.). But beginning in dimension 4 the topological and smooth=PL theories are different; there are 4-manifolds that have no smooth structure. And beginning in dimension 7 (I think?) the smooth and PL theories are different. Well, this probably what anyone who doesn't actually work in 3-manifold topology can quite happily do! But my point really is that one can happily work in 3-manifold topology, even with such an important and basic conjecture still unsolved. One can easily argue that Fermat's Last Theorem (its solution, that is) will not really have any great impact on the future of number theory (its proof, perhaps, but...), but I doubt this will be the case for the Poincare conjecture. Quite the opposite, really - its proof is likely to be highly specialized, and the techniques are likely not to have a great impact on other problems, but the statement sits at the heart of what 3-manifold topologists see as their mission: to understand what 3-manifolds look like. [OK, this statement might have been a little over the top. Certainly one might argue that Perelman's current proof has little to really say directly to the 3-manifold topologist? But it has *a lot* to say to the analyst! And the techniques are sure to find wide application to other problems.] So how do you deal with the fact that there is this glaring hole in our understanding of what 3-manifolds look like? Basically, you figure out exactly how big the hole is, and concern yourself, for the time being, with figuring out what the rest of your 3-manifold looks like. That deserves some explanation. The point is, one can restate the Poincare conjecture as saying that the only contractible, compact 3-manifold (which must automatically, for homological reasons, have boundary a 2-sphere) is the 3-ball. Any counterexample to this conjecture is called a homotopy 3-ball (this leads to the slightly confusing fact that the 3-ball isn't a homotopy 3-ball! (Or, at least, that's what *I* understand the terminology to mean.)). Now there is a standard construction in 3-manifold topology called a connected sum decomposition, "#", which cuts your 3-manifold up along 2-spheres into irreducible pieces ( = those for which any further cutting will only carve off a (punctured) 3-ball). Milnor showed that the (non-3-ball) pieces are unique up to reordering. If we collect all of the homotopy 3-ball pieces together (if such a thing exists), they together form a single homotopy 3-ball. We can then express any 3-manifold M as M=(homotopy 3-ball) u N, where N does not contain a homotopy 3-ball. In other words, N will not contain a counterexample to the Poincare conjecture. *In other words*, if we content ourselves with proving results about *N*, instead of M, we can go about our work acting as if the Poincare conjecture is *true*. N is referred to as the Poincare associate N=P(M) of M; from the point of view of algebraic topology, you can't distinguish between P(M) and M. From this way of viewing things, all that the Poincare conjecture says is that you can't distinguish between P(M) and M at all, because they are in fact the *same*.